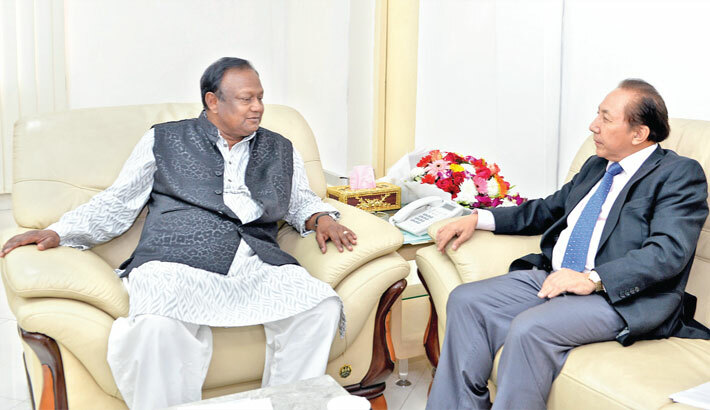 Commerce Minister Tipu Munshi exchanges views with Bhutanese Ambassador in Dhaka Sonam Rabgye at the former’s office in the capital on Monday. Commerce Minister Tipu Munshi on Monday has urged Bhutan to use the Syedpur Airport for better connectivity. The minister made the call when Bhutanese Ambassador in Dhaka Sonam Rabgye called on him at his office on Monday, a ministry release said. A special initiative with regard to this is required as it will benefit both the countries in terms of bilateral trade and tourism sector. “Bhutan is a friendly nation of Bangladesh that had given the first recognition to Bangladesh as an independent state,” the minister commented. “There is a huge scope of increasing bilateral trades between the two countries, which should be explored,” he added. The commerce minister said bilateral trade balance is largely in fabour of Bhutan, adding that although Bangladesh exports readymade food and garment and pharmaceutical products to Bhutan, but import construction materials from there. In 2017-18 fiscal year, Bangladesh exported goods worth $4.4 million to Bhutan, while it imported goods of 32.28 million.